XingSound is an MP2 and WAV audio player for Win16 created by Xing Technology Corporation. It is as minimalist as can get, not even pause is implemented. Its only functions are "Open", "Play", "Stop" and "Repeat". The first version available here is dated 1993 - that makes it the oldest software featured at ReallyRareWares to this date (before XingSound, the oldest program here was Sonarc). Considering that in 1993 most of us were still using 286s and 386s, Xing also added to their player the option of half and quarter quality playback, similar to an option available to this day in MP3 players. Decoding quality is reasonable. For MP2 decoding, the Philips MPEG player offers higher accuracy. 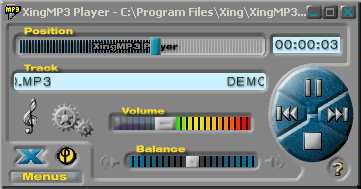 Years later, Xing created the XingMP3 player, a companion for their MP3 encoder and CD ripper (AudioCatalyst). It is way more featureful and better looking than its predecessor.